Learn the fundamentals of technique including grip, stroke and posture. Learn musical foundations of percussion including rhythm, dynamics, melody, listening and notation. Learn the fundamental co-ordination exercises in control of hands and feet. Sticking exercises using R and L Notation. Introduction to the drumset and instruments of the percussion family. 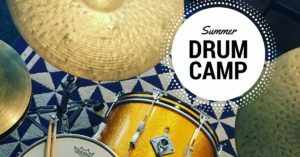 No prior drumming required but students should be able to participate in a classroom and individual learning environment for sessions up to 45 minutes at a time. Campers will receive a pair of Vic Firth drumsticks to be used throughout the week and several handouts of music and exercises. Please note, this camp is not appropriate for children who require physical support or restraint and/or exhibit intensive behavioral or functional needs and significant challenges. Parents are encouraged to stay with their child in the sessions and participate with us!